Can I Protect My Trading Name and Logo? Can I Protect My Product Design? What is protect my work? Protect My Work has been developed in order to enable individuals and organisations to protect their work from being unlawfully used. By registering your work with us, it will act as a deterrent to others who may be tempted to use your work without permission. What kind of original work is protected by copyright law? Literary, dramatic, musicals and artistic work, including books, plays, poems, design, illustration & photography, logos, & training courses. How copyright law protect your work? Copyright prevents other people & companies from making a copy of it, adding it to a website, distributing it on any other media (whether for money or free), performing it, showing or playing your work in public and changing it. How long does your legal copyright last (UK)? Countries denoted with a * may require additional measures to properly protect your work. After registering, I have not received my password from you by email? Please check your email SPAM or Junk folder for missing emails, as sometimes emails get put there by mistake by your email provider. Hotmail and Outlook.com junk just about everything, so we advise you do not use these email addresses if you can help it. Gmail email addresses we find are the most reliable, and have a sensible junk policy. £ 33.00 excl. VAT per year subscription fee. A £ 1 excl. VAT token is required for each piece of work submitted thereafter. Note: Total size of files must be less than 50MB in each £ 1 excl. VAT token you use. A certificate token is simply a group of files that you upload to us that we date stamp and certify for you. 1 token = 1 digital certificate. Once used, each token gets assigned a unique reference number & password by our system. Work files and certificate data can NEVER be changed or edited in any way after use , as this would invalidate our fixed date stamp. Work can of course be deleted, along with that token at any time by you, but the token is not re-usable after deleting it. More tokens cost just £1 excl. VAT each and you can buy more instantly online through our site at any time. Can I use the copyright symbol (©) on my original work? Yes you can, but you do not have to. Omitting this symbol does not affect your legal rights and the level of protection. By Uploading: You can also submit your work by logging into the members area and uploading to our secure server vault from the Upload New Work page. What kind of computer files can I protect? You can protect any type of digital file with Protect My Work. Any file format can be emailed or uploaded to our secure vault. For example: .doc, .jpg .gif .bmp .png .psd .xls, mp3, .mov, txt, the list goes on. The only file that cannot be submitted is an .exe. Avoid using apostrophes ( ' ) or speech marks ( " ) in the file names of the files you send us as these characters can interfere with the website code. Should I submit only my final piece of work or all connected material? It is to your benefit to upload all connected material, not just the final version of your work. (i.e., previous designs, documents outlining an idea etc.). This can be very useful evidence should you have to prove you are the author. Does ProtectMyWork.com use SSL (Secure Socket Layer)? Payment is made using Paypal, using your credit / debit card or even bank account. How will my clients know my work is protected by you? 2. Or email the work to your client and 'Cc' us. How can I view work I have submitted to Protect My Work.com? There are two ways to view protected work: Simply log into your account and click on 'My Protected Work'. Enter the unique username and password for that protected work on the Search Protected Work page. You will receive this when you have confirmed registration of your work with us. Can a third party view my work online at Protect My Work.com? Yes, BUT ONLY if the unique username and password is entered correctly on the Search Protected Work page. Only people that you give these details to will be able to view that piece of work. Can I send a notice to my client stating that I have submitted the work attached in an email to Protect My Work? Yes, if Third Party Notification set to 'Yes' (see tick box in Account Details in our login area), and you send your work by email to us at protect@protectmywork in the TO field, with a CCed recipient your email , we will then send a registration notice to the person you CCed the your email . 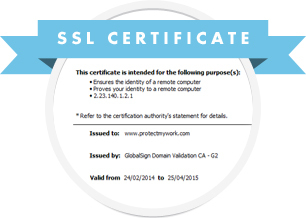 This ensures that person is aware your work is protected and can login to see the work and the certificate. This service is free of charge. What should I do if my work is stolen? Approach the client and let them know that the work was registered with Protect My Work. If they refuse to stop using the work, you can threaten legal action to recover damages and share of their profits using your submission to Protect My Work as evidence of ownership and copyright infringement. Can I do anything else to protect my work? Yes. You should always add the following text somewhere on your work e.g. : © 2018 Your Name/Company Name. All Rights Reserved. Is there a size limit on the work I can email? Yes. We have a 50 megabyte limit on work that is emailed or uploaded to us. If your work is more than 50 megabytes, try and compress your work (try using zip files). If your work is graphically based, compressing to Jpgs can reduce the size significantly. How can I compress my music files to an mp3? There are many software programs on the Internet that will convert your sound files to mp3. Some are free like FreeRip which offers basic conversion to mp3, and there are other more sophisticated software programs available for a small fee, many of which can be found using Google. Does anyone at ProtectMyWork.com ever view my work? No. Your files are submitted to us and remain confidential. No one at Protect My Work will open files unless asked to do so by you. How long does copyright last legally? The length of time will vary according the type of work. Here is a link that explains how long copyright lasts..
What happens if my subscription to your site expires? Your work will no longer be protected so please do renew each year. Subscriptions are automatically charged every year to your paypal account or credit/debit card. If you cancel this renewal, then your subscription to Protect My Work will not get automatically renewed. If you find your account does expire, you can simply Login and you will be given the option to pay for a renewal. You have up to 30 days after expiration to renew the account, after this your files and date stamped certificates will be marked for deletion and so no longer be protected by us. Why do we charge an annual subscription fee? We charge an annual fee because we keep the work you register with us online, with your digital certificates, so it's available to you any time you may need it in the event of a future dispute. We have to cover ongoing costs such as technical support, company management as well as server maintenance and storage. The small annual fee of £33 covers these costs and we hope is affordable to the creative community. We have been trading successfully since 2004 and by charging this small annual fee, instead of a large up front fee, this ensures we will be able to operate in perpetuity , meeting future costs with future revenues, and so are able continue to support you. Some other copyright companies charge a high up front fee for "lifetime storage" but they spend your all your money, and so have nothing to meet future costs of their company, so most go bust. Most recently, a company called 'Duly Noted' did exactly this, and of course anyone who had filed their work with them, have now unfortunately lost their evidence. Protect My Work has many thousands of happy subscribers, we know our business model works well and are built for longevity.